My Mother’s Christmas Gift – Find You in the Sun – A daughter's slow waltz with her mother's dementia. Two months ago, my parents moved to an independent living care community nearby. They live independently only because my father’s mind is intact, if not his ability to sign Christmas cards. A caregiver attends to Mom’s needs once a week to give Dad respite, and encourage Mom to participate in activities around the community. The monthly calendars published by the Lodge Community boasts all sorts of field trips – Cracker Barrel and Movie, the Mighty Wurlitzer at Music Hall, Sharon Woods in Lights. Many of these my father takes advantage of. 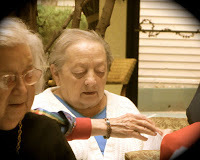 Mom’s outings are limited in scope because of her attention span, and her “sundowning”. At dusk, she becomes anxious and wants to return home. Within the community, there are activities for Arts and Crafts, Let’s Have Fun, Chair Volleyball, and Communion and Rosary. But there is also the Choraliers. A musically-inclined piano player, Alice, comes to the Lodge, and directs residents who choose to participate in choral practice once a week. Then, the group performs for various audiences in-house, families, and last week, traveled to another senior center. At my urging, Mom “decided” to join the choir. The caregiver, Elizabeth, accompanied Mom to the first practice. No one had any idea how long Mom might sit. But Elizabeth was getting paid by the hour, so it was no matter to her. For a few weeks, Mom attended practice with Elizabeth. Even Dad took Mom one week, and was forced to sing along. I agreed heartily with her, recalling her days dragging us to Midnight Mass so she could sing in the church choir, and too, she was part of the Resurrection Choir, which sang at all the funeral masses. Her voice, though not booming, was always perfect pitch, and devout. “I wish I would have learned how to sing when I was little,” Mom reiterated. “Well, yes, something like that.” She beamed knowing I understood. Mom moseyed off into the family room, to perform her other task at my home, closing the plantation shutters. Monday of Mom’s performance arrived. I met up with Mom and Elizabeth, strolling through the lobby on their way to be seated for the show. Mom kept motioning for me to sit by her, in the choir’s chairs. I repeatedly signaled that I would sit in the audience. I took a seat near the front, but didn’t want to be distracting. On occasion, I had to look away from Mom, because I was in tears, reflecting on the years of Christmas past, her beautifully-decorated home, her perfectly round meatballs, and crisply pressed pizzelles. But Mom didn’t miss a note, singing happily – no, joyfully. When I was five, my mother had bought me a Mrs. Beasley doll for Christmas. In high school, Mom gave me purple corduroy jeans as a Christmas gift. Over the years, her selections were conscious choices gleaned from scribbled lists, dog-eared pages of the Sears catalog, or a whisper from a sister. Mom could not have known, that at age 84, the best gift she could have presented to me was her voice.